This beautiful large-print Bible features the fruit of the Spirit on the cover to remind you of the great work God is doing in your life. The slim, easy-to-carry size combined with the large-print text makes this Bible great for everyday use. Deluxe features include words of Christ in red, two ribbon markers, and extra-large thumb index. 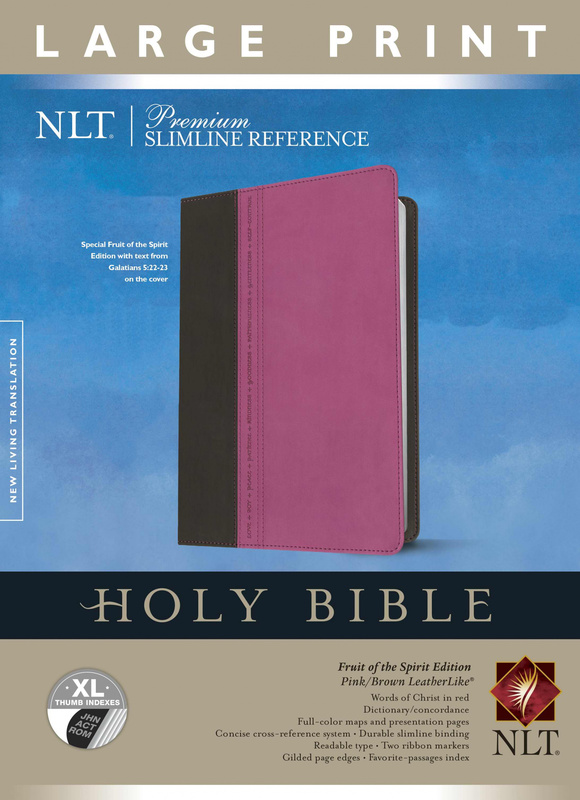 Premium Slimline Reference Bible NLT, Large Print TuTone, Thumb Index by New Living Trans 2 was published by Tyndale House Publishers, Inc. in March 2015 and is our 9954th best seller. The ISBN for Premium Slimline Reference Bible NLT, Large Print TuTone, Thumb Index is 9781414397658. Be the first to review Premium Slimline Reference Bible NLT, Large Print TuTone, Thumb Index! Got a question? No problem! Just click here to ask us about Premium Slimline Reference Bible NLT, Large Print TuTone, Thumb Index. A:Thank you for your question. The font size of this bible is 9pt. I hope this is helpful! A:Thanks for your question. I can confirm that the dimensions of this bible are 254mm x 184mm x 32mm. In inches this is 10" x 7.24" x 1.26". I hope this is helpful!